The symbol on the Wall next to Carl's name was changed from a cross (MIA) to a star (KIA) April 30, 1994. Remains were identified. SYNOPSIS: On November 16, 1968, (then) Major Carl F. Karst, pilot, and Captain Nguyen X. Quy, VNAF observer, departed Pleiku in an O1F on a visual reconnais- sance mission over South Vietnam. At 1640 hours (4:40 p.m.), shortly after takeoff, Karst reported that his position was two nautical miles east of Plei- ku, and that he was proceeding with his mission. When subsequent attempts to raise Karst by radio failed, a search began. The search continued for three days without success. Karst was classified Missing in Action. A few months later, a Vietnamese informer reported information given him by a NVA/VC propaganda team that Karst's aircraft was shot down by small arms fire and the Vietnamese observer was killed. The informer stated that Karst evaded to the south, but was captured and executed in a village in northern Phu Bon Province. The informant did not witness any of these events. The report was considered inaccurate because the a NVA/VC team was known for coloring stories to impress the local population, and because Karst was very knowledgeable of the location of Viet Cong and North Vietnamese units in the area. Those who knew Karst agreed that he would not have evaded to the south, but rather to the west where he knew he might reach friendly forces and safety. In December 1983, a refugee turned over two bone fragments and a rubbing of a metal ID tag bearing Karst's name to U.S. officials in Malaysia. He stated that he had been given the remains and rubbing by a Buddhist monk in 1981. The refugee was told that the remains were among 7 American remains recovered at an unspecified location in the Central Highlands. By 1984, U.S. officials had received a series of reports from eight separate sources reported information concerning the alleged remains and dog tags of Karst. Four provided information solely on Karst, while the other four sources related Karst's name to other Army personnel who had returned from Vietnam at the end of their tours. 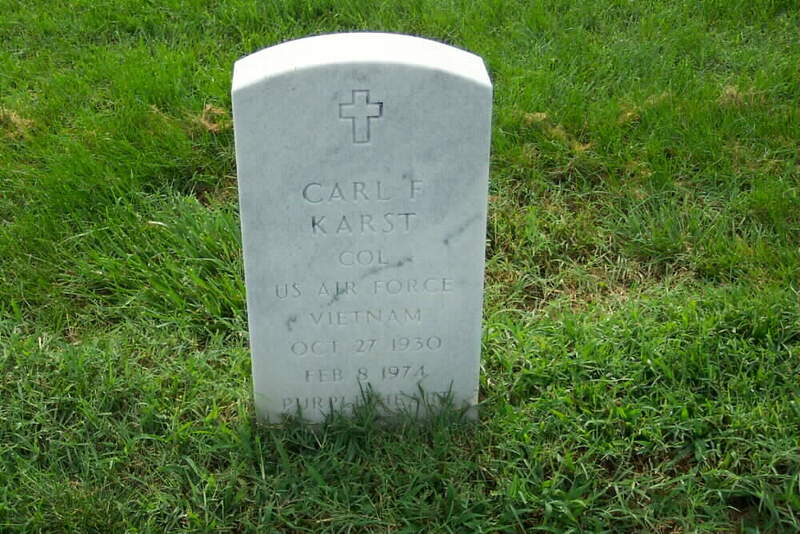 Twenty-five years after he disappeared in a plane crash in South Vietnam, Air Force Colonel Carl Karst was buried at Arlington National Cemetery. Vietnamese officials turned over Col. Karst's remains in 1989, but they were not identified until last month by the Army's Central Identification Laboratory in Hawaii. Colonel Karst was 38 when he was shot down while flying a Cessna O-1 "Bird Dog" reconnaissance plane on a mission November 16, 1968. He was buried Friday with full honors and an Air Force flyover. He is survived by his wife, two sons and a daughter. Arlington, Virginia -- With great dignity and poignancy, the nation paid its last respects Friday to Colonel Carl Karst, a moment delayed and denied for 25 years. Karst, an Air Force colonel and a native of Barton County, Kansas, died in a plane crash in Vietnam in 1968. But two decades passed until his remains were returned to this country, were positively identified, and a burial was arranged. On a golden autumn morning Friday at Arlington National Cemetery, the moment for that last salute finally arrived. Karst's wife and their three children now adults with children of their own watched as Karst's flag-draped casket was solemnly carried by horse-drawn caisson to be buried on American soil. Four US Air Force F-16 jets roared overhead in the Missing Man formation. "Everyone, I think, was moved by the military ceremony, the flyover, the band; all of it together was just such a solemn and dignified way of bringing closure to a time that has been full of all kinds of emotions," said Ruth Nelson, Karst's widow who has since remarried. Accompanying Karst's immediate family were relatives from throughout Kansas. Family friends. Old Air Force buddies. Newer friends from MIA groups. And an old neighbor from long ago, Bob Dole from nearby Russell, now a U.S. Senator. If the burial resurrected some pain, the greater feelings seemed to be those of gratitude. Finality. And peace. "I know every family member feels very good about it," Dole said after the grave-side service. To honor its fallen comrade, the Air Force proffered the special majesty and sounds of a full military burial at Arlington National Cemetery. The clip-clop of hooves from the team of horses. The hollow cadence of drums. The mournful strains of the Air Force Hymn. The crack of a 21-gun salute. The lonely call of "Taps." And then, silence, as the American flag was removed from the casket, folded crisply into a triangle and presented to the family. Military funerals have not greatly changed in the past 25 years, but feelings about Vietnam have. When Karst died 25 years ago, this country was bitterly divided about the costs and value of that war. And if some division remains, there is little dispute about the honor due the men and women who served their country in Vietnam, and for those who did not return. "Regardless of the validity of the Vietnam War and we knew there was controversy the men who served in the war did so with honor and dedication," Nelson said. Karst's dedication is reflected in his military honors, including the Distinguished Flying Cross, the Bronze Star and the Purple Heart. He was a 14-year Air Force veteran when his reconnaissance plane was shot down in 1968. He was officially listed as missing in action until 1974, when military authorities changed his legal status to killed in action. His body was returned by Vietnam in 1989, and a positive identification made this year.